The Omega Green Supreme is the quietest, most powerful service vacuum available. The new motor uses less energy. The Omega Green Supreme is made from high-impact starex flame retardant ABS polymer for durability. 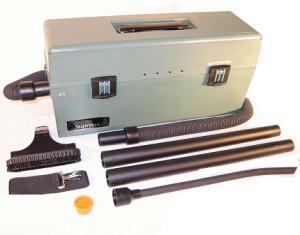 The Green Supreme 1 Gallon HEPA dry particulate vacuum is ideal for the RRP Contractor. With its self contained HEPA filter, hose plugs and filter plugs, the Green Supreme makes filter changes, transporting and storing safe! To meet the RRP standard, this vacuum includes an air driven turbo brush.